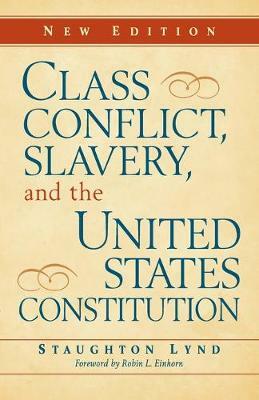 First published in 1967, Class Conflict, Slavery, and the United States Constitution was among the first studies to identify the importance of slavery to the founding of the American Republic. Provocative and powerful, this book offers explanations for the movements and motivations that underpinned the Revolution and the Early Republic. First, Staughton Lynd analyzes what motivated farm tenants and artisans during the period of the American Revolution. Second, he argues that slavery, and a willingness to compromise with slavery, were at the center of all political arrangements by the patriot leadership, including the United States Constitution. Third, he maintains that the historiography of the United States has adopted the mistaken perspective of Thomas Jefferson, who held that southern plantation owners were merely victimized agrarians. This new edition reproduces the original Preface by Edward P. Thompson and includes a new Afterword by Robin Einhorn that examines Lynd's arguments in the context of forty years of subsequent scholarship.